An Awesome Life: Disorganized? Who, me? Right, so you all hate Mondays... I don't really "have" Mondays anymore... blah blah blah. Well, for your information, I'm no longer unaffected by Mondays. I'm actually glad to see Monday today. Yup. I said it. Boyfriend has gone to the city to work for the day and it's rather cool outside so I threw open the windows for some fresh air, made myself some tea, and sat down to tackle a stack of miscellaneous crap that has accumulated on my end table (it's really more of a bookshelf). Once I had enough piles, I realized that some of the piles needed a home in the office, but the office looked like a tornado had passed through. Then, I decided I would just tackle organizing anything I could today, so I got on Pinterest and started searching office and kitchen organization. And then I got lost in the lovely world of Pinterest and started searching everything. 3 hours and a lunch-break later and here I sit. Nothing is organized, and I've created an even bigger war-zone. There are piles everywhere, along with the aftermath of my lunch-making escapades (I made poutine for which, of course, I had to make bacon). It was a 3-appliance, multi-utensil adventure and we have no running water today. I think it's time to pour a vodka, or maybe crack a beer. This is going to require more effort that I had accounted for. One thing that I desperately need to include in my office organization is a place to store all of the nail crap I've accumulated. Just this weekend I bought 4 new bottles of nail polish and took over the kitchen at least twice to try fun things with my nails. 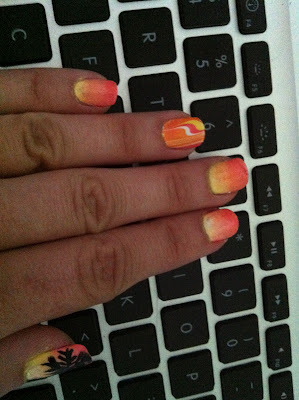 Last night, I made my own version of these sunset nails using this tutorial as a guide. They were super easy to do and turned out alright, but I definitely need some smaller brushes if I'm going to start painting palm trees and such. 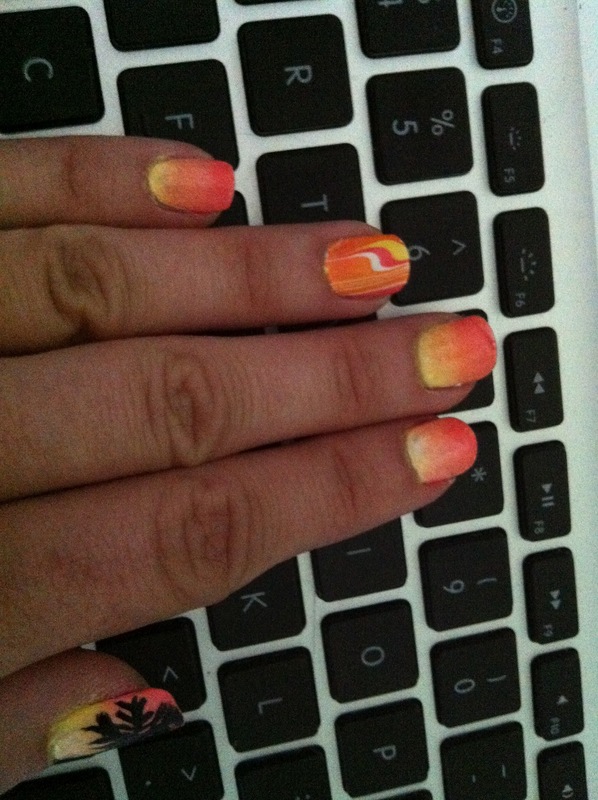 *Ignore my ring finger, I was just seeing what the colours looked like in a marbled effect, which was my original intention when I sat down to paint them. Speaking of sunsets, here is a photo I snapped of the first official sunset of Summer 2012. The colours in the sky were incredible! Alright, I think that's enough procrastinating for one afternoon. To organize, I go! !